Brief: second generation of Creative’s highly-regarded Aurvana Live! Build Quality (8/10): The original Creative Aurvana Live! has been a budget-friendly audiophile favorite for as long as I can remember not only for its sound, but also its light weight and outstanding comfort. It was never considered a particularly tough headphone, though, and the story is much the same with the new version – mostly plastic parts with a metal headband. The cups are a little thicker compared to the first-gen model, largely due to the way they attach to the headband, but overall, I like the aesthetic of the new CAL! better. The construction also feels a little more solid in the hand, with no shakes or rattles despite the fact that it has more moving parts due to its ability to fold flat for transport and storage. The CAL! 2 boasts a detachable cable with a 2.5mm connector at the earcup end. While I would have preferred the more common 3.5mm, I’m glad it’s not a proprietary connector and quality replacements won’t be difficult to come by. The stock cable is flat in cross-section and has an inline mic and remote, as well as an analog volume control. The remote and microphone are split up into two separate modules, with the mic located a few inches higher up on the cable than the remote for better voice capture. The analog volume control slider means volume control functionality not only with iPods and iPhones but with most Android and Windows Mobile devices as well. Comfort (9.5/10): The official product shots of the new CAL! 2 make it look bulkier and heavier compared to the original CAL! but I am pleased to say that the new headphone stays very true to its predecessor on the comfort front. The plastic structure keeps the weight very low, the cups are nice and deep, and the memory foam pads have a large internal diameter. All this yet again makes the Aurvana an absolute standout in wearing comfort, easily the most comfortable portable circumaural headphone in my possession. The only negative, and it is a small one, is that the protein leather earpads can get a little warm with extended wear. Isolation (6/10): Though leakage is rather low, the passive isolation of CAL! 2 is not great for a closed headphone – enough to make it usable outside, certainly, but not great for noisy environments. Sound (8.25/10): Listening to the CAL! 2 makes it clear that Creative has chosen not to mess with a good thing too much when it comes to sound. The CAL! 2 is a warm-sounding headphone with impactful bass, its sound a little shifted towards the low end compared to the original Aurvana. Denon did the same thing with their AH-D1100 model in comparison to the previous AH-D1001, but the result there was a monster with more bass than I could tolerate. The CAL! 2 keeps its composure better – it’s a bassy headphone, but not overwhelmingly so. The midrange of the CAL! 2 drops off somewhat in emphasis and is well warmed-up by the prominent bass. Impressively, midrange clarity is similar to the rather thin-sounding Sennheiser HD428, which has very little bass in comparison to the Aurvana Live! 2. The Aurvana is also clearer and more detailed compared to the recently-reviewed Rock-It Sounds R-DJ despite having stronger and deeper bass, but gives up some clarity to the much more expensive – and significantly brighter – Monster DNA Pro. The CAL! 2 remains smooth and relaxed through the upper midrange and treble. The top end doesn’t come back up to the level set by the bass for that v-shaped sound signature, instead providing a very inoffensive listening experience somewhat lacking in treble energy. The treble is smoother compared to the R-DJ, HD428, and DNA Pro. As a result, the CAL! 2 is very tolerant of sibilance, harshness, and poor mastering – out of the headphones I’ve tried recently only to the Velodyne vTrue can compete in this respect. There is no chance the CAL! 2 will sound fatiguing to anyone, though the smoothness and lack of a prominent midrange may encourage higher listening volumes. The presentation of the CAL! 2 is good, especially compared to the vast majority of on-ear headphones. It gives up a little bit of soundstage width to the R-DJ and the heavy bass can be a touch detrimental to overall imaging but overall, for a bass-heavy headphone, the CAL! 2 is plenty spacious. A warm-sounding headphone with surprisingly strong mids, the DNA is Monster’s answer to the Beats by Dre Solo following the Beats/Monster breakup. Though it is a small on-ear portable, the DNA is a better signature match for the CAL! 2 than the circumaural DNA Pro. It doesn’t quite have the sound quality to compete with the Aurvana, though, sounding muddier despite its forward mids. The CAL! 2 has more emphasis on the low end but its bass is tighter compared to that of the DNA. The bass-centric balance of the Creative set does have an effect on the mids, which sound a little veiled and recessed but still more natural compared to the DNA. At the top neither headphone has great energy or sparkle but the DNA has a much smaller soundstage, sounding consistently congested thanks to its forward, aggressive sound signature. The Crossfade LP2 is V-Moda’s enhanced-bass headphone, complimenting the more audiophile-oriented Crossfade M-80 and M-100 models. Compared the Creative Aurvana Live! 2, it is significantly bassier, boasting more mid-bass impact and sub-bass slam. Considering that the Creative set is not bass-light by any measure, this shows just how powerful the bass is on the V-Moda set. The LP2 pays the price, however, with audibly greater bass bloat and mids that appear somewhat muffled compared to the CAL! 2. The Aurvana sounds significantly cleaner in comparison. Both have somewhat subdued treble but the Crossfade LP2 also suffers from a slightly more congested presentation. Though the M-80 is a compact on-ear headphone, it is the only warm-sounding set in my collection that could compete with the CAL! 2 in sound quality, making for a worthwhile comparison. The M-80 is a rather balanced headphone but still has stronger bass and mids relative to its top end, giving it a warm overall tone. The CAL! 2 places more emphasis on its bass and less emphasis on its midrange, sounding a little recessed there compared to the pricier M-80. Clarity is mostly similar between the two headphones – on bass-light tracks I thought he CAL! had an advantage but as soon as its big low end came into play the more prominent mids of the M-80 suddenly won out. The mids comprise most of the difference between these two headphones; stepping away from the midrange, bass control is better on the M-80 while the CAL! 2 is a little more spacious in presentation. Velodyne’s flagship is an enhanced-bass headphone that seems to be tuned similarly to the new Aurvana – smooth, warm, and certainly not light on the low end. Like the Aurvana, it is a large, closed over-ear headphone that is intended for use both at home and on the go. Compared to the CAL! 2, the vTrue has fatter, more boomy bass and sounds warmer overall. Its midrange is more forward but unlike that of the M-80, it is also thicker compared to the CAL! 2 and sounds less clear as a result. The Aurvana Live! 2 is clearer and also has a little more treble energy than the vTrue, as a result sounding more balanced and refined overall compared to the Velodyne. Both have good soundstage width with spacious presentations, a necessity with all that bass in order to avoid congestion a-la V-Moda Crossfade LP2. 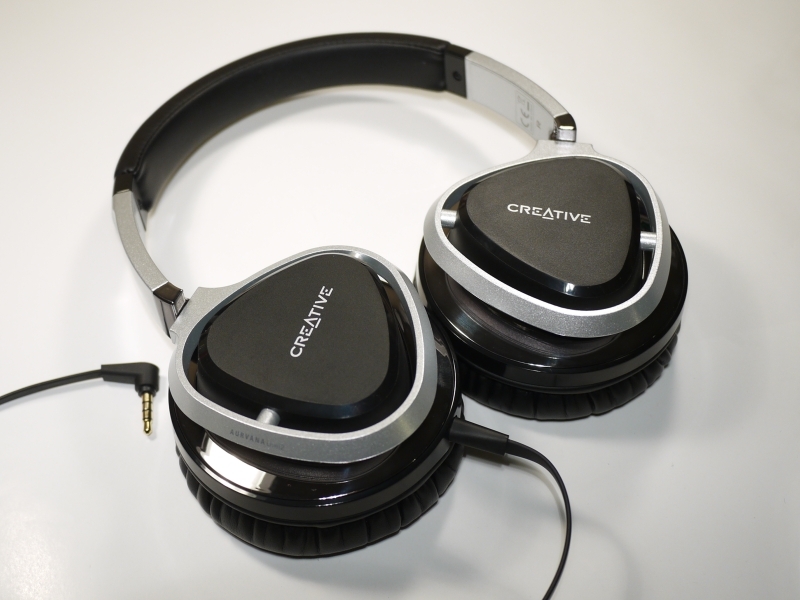 Value (8.5/10): Six years after the release of the original Aurvana Live!, Creative has given the headphone a redesign with the Aurvana Live! 2. The CAL! 2 delivers a warm and lush sound with plenty of bass and good clarity. It may not be the best headphone for accuracy, but it has the perfect consumer sound – warm, impactful, and smooth even at high volumes. It’s also one of my favorites for wearing comfort, thanks to the spacious ear cups and the extremely light weight and, as before, the price is right, with similarly-performing headphones from other big-name brands easily running into the $200 range and higher. The original CAL! is still a great choice, especially as it’s often discounted, but as a bassier option competing with the many enhanced-bass headphones on the market, the new CAL! 2 has a lot going for it. Which other similar sound signature, portable/no dedicated amp needed headphones have bigger or similar soundstage? I enjoy your reviews. I just wanted to know under what category you would assign the original CAL!1 ? ‘Warm and Smooth’ or ‘balanced’ ? I’ve always thought of them as warm and smooth. They’re not terribly unbalanced, but there is still a noticeable warm tilt. buyers guide, which IEM would you say has a similar sound profile as Cal!1? IEMs and headphones have some basic presentation differences so they will sound a little different even if the tuning matches (especially the bass and soundstage). I would say the Sony MH1C is a good place to start for this type of sound. Hi, are there any other over the ear headphones that you think are similar to the mh1c or do you still feel that the CAL!1 are the most similar? Hi Joker! Is it safe to say that (in terms of sound quality) this is a step up from the cheaper CAL 1? I had a chance to audition CAL 1 and I can get it for $80. Is CAL 2 worth the extra $50? Thanks! No, not in sound at least. The CAL!1 is more balanced and very capable in audio performance. The CAL!2 has more bass and a warmer tone, if you’re into that, but it’s not really “better”. How does the bass compare to the Nuforce 600x? I’m hoping the extension is just as good if not quite as impactful. One more thing, would the memory foam or the inside of the cups touch your ears at all? I have average size ears. Thank you. Extension is very good, no significant roll-off. It might not have an emphasis on deep bass over mid-bass, but the depth of the low end is fine. The cups are very spacious – your ears shouldn’t touch anything.